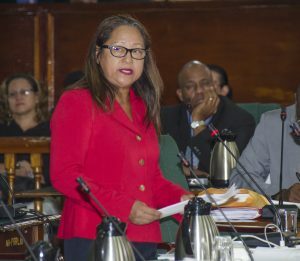 Opposition MP Pauline Sukhai is calling for the David Granger administration to clearly show how much money has been budgeted for youth development in 2017. Sukhai called the government to task pointing out there are no youth on the Cabinet of Ministers, and that a sinlge seat in the National Assembly, held by MP Jermaine Figueira, was set aside for youth. Sukhai went on to highlight the zero presence of youth in Guyana’s foreign service, state boards, [and] councils. 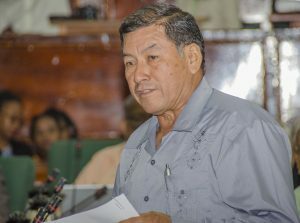 It is unclear whether MP Sukhai, a former Amerindian Affairs minister under the previous government, referenced “councils” to speak about local government bodies. It is important to note however that a number of youth have ascended to leadership across Guyana’s local democratic organs. Most notable are Georgetown Deputy Mayor Sherod Duncan, and Lethem Deputy Mayor, 19-year-old Maxine Welch. Sukhai turned her attention to the proposed $50M Youth Innovation Fund announced by Finance Minister Winston Jordan during his budget presentation. Sukhai called the fund “meagre” noting that a business today “would almost eat up $50M.” She questioned how the administration intends to invest in youth and promote youth entrepreneurship among youth with the $50M. Turning her attention to the national youth policy recently approved in the National Assembly. Sukhai questioned whether there were any allocations within the budget to ensure the problems and challenges faced by youth are alleviated. Speaking to indigenous youth, Sukhai mentioned Guyana’s upcoming oil and gas sector questioning whether there is a clearly-defined space for indigenous youth even with some $650M set aside for scholarships and other initiatives in the oil and gas sector. Immediately following Sukhai’s presentation was Indigenous People’s Affairs Minister, Sydney Allicock. Allicock immediately responded to a comment made by Sukhai where she mentioned some 1900 indigenous youth who were supposedly fired from a programme facilitated by the Indigenous People’s Affairs Ministry. Allicock clarified that the decision to let go the 1900 youth was made by the PPP administration. “It was a cabinet decision by the PPP to have the work of the CSOs come to an end in march ,” Allicock responded noting this was done without affording them any compensation. The Minister went on to say the youth employed under the project were trained as mobilisers for the former PPP government rather than as community developers. Responding to Sukhai’s question on the role of indigenous youth in the oil and gas sector, Allicock said Guyana is not yet ready to have our locals occupy jobs on the oil rig. “But we are preparing for the indirect benefit. This is what we have to capitalise on.” He said the planned interventions in that regard will link the skills of Guyana’s youth with the demands of investors.